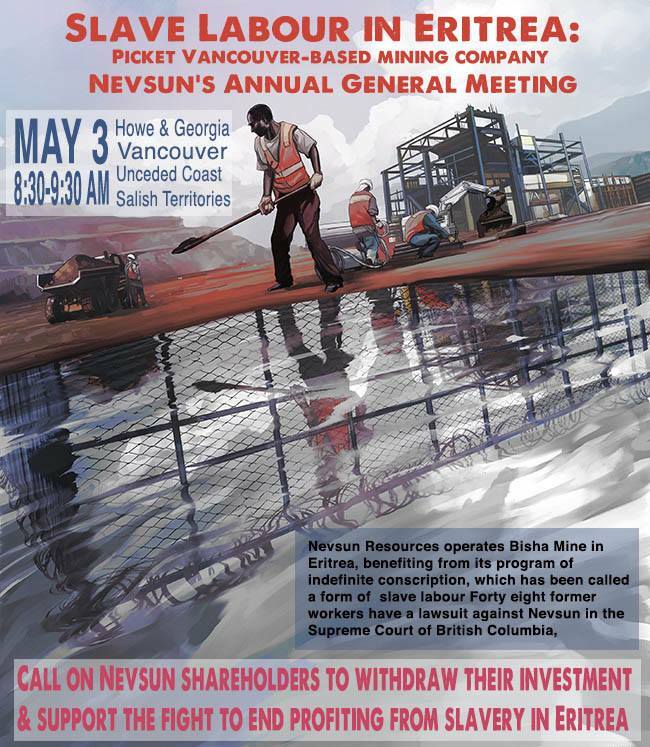 Community members will join Vancouver’s Mining Justice Alliance outside Nevsun Resources’ Annual General Meeting on Wednesday, May 3rd, to call attention to accusations that the company profits from slave labour at its Bisha gold/copper mine in Eritrea. The group will present a petition and make the case that the company’s investors must divest from operations in Eritrea, a country where forced labour is widespread. See the Facebook event listing. See the petitions: Sum of Us petition “Slaves in a Canadian-owned mine”. Freedom United: Help Stop Profits from Slavery in Eritrea.